Sonic the Hedgehog fans looking for something 2D and side-scrolling to tide them over until Sega's "Project Needlemouse" pokes its way to consoles can spend some time with LittleBigPlanet's Sackboy later this year, thanks to new Sonic-themed costumes. 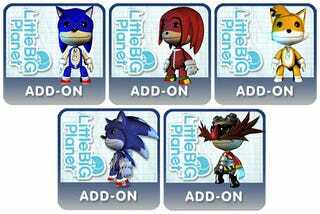 According to PlayStation.com's Hong Kong presence, as spotted by Siliconera, LittleBigPlanet costumes that ape Sonic the Hedgehog, Sonic the Werehog, Tails, Dr. Robotnik (aka Eggman) and Knuckles will be available later this year. December 17, at least in Hong Kong, to be exact. While we'd PlayStation.com to be right about the particulars, we're checking in with Sony and Media Molecule to see when we can enjoy dressing our Sackboys up as Sonic and his friends on our PS3s.